To some of my surf friends, that phrase–“stoked out of my mind”–is sort of my catch phrase. In fact, there’s a guy who just calls me “stoked.” I love the nickname, and after a weekend of more or less non-stop surf, and tweeting about it equally non-stop on Twitter, I thought I’d expand upon the concept a bit. “Stoked” is very common parlance in surf culture. It is used as an adjective to describe when you are feeling very, very good. It is not the same as “stoned,” although I think the stereotypes of surfers as stoners leads many outsiders to think that they are synonyms. I think that works for the most sake, but it’s a bit much, especially the last line of “there is no limit to what one can do.” Being stoked does not make you feel invincible or Superman-esque. What to me makes “stoked” the feeling that it is lies in its ability to distort, in such complex and flexible ways, the human perception of time. Time is a different element completely when you’re surfing. A good surf session for me is about 2 hours in the water. At a spot like Ocean Beach, you’re probably spending 60% of the time actively paddling, with about 25% of that active paddling being at full-speed. Then 39% is chilling out, waiting for waves. If you’re lucky you’re spending about 1% of the time out in the actual process of riding a wave. A good ride is 5-10 seconds long, which in real time is ridiculous. Why all these surfers dedicate so much attention and energy on something that takes less time the the average trip to the urinal seems absurd. When you’re on that wave, it becomes almost impossible to actually determine how long you are doing what you’re doing. You take a big turn off the lip, and then you re-visit it time and time again and it becomes a timeless experience. It doesn’t matter how quick it was, it feels infinite because you keep thinking of it. On big waves, you’re falling down the face, and who knows how long a feel actually takes, but when you’re rushing down a 20 foot face it feels like you never started or never stopped falling, you just are in the constant state of falling. When you paddle out at Ocean Beach on a big day, and get stuck inside, and just go over and over again, duck-diving and paddling, duck-diving and paddling, it starts to feel like it’s the only thing you’ve ever done, and the only thing you will ever do. 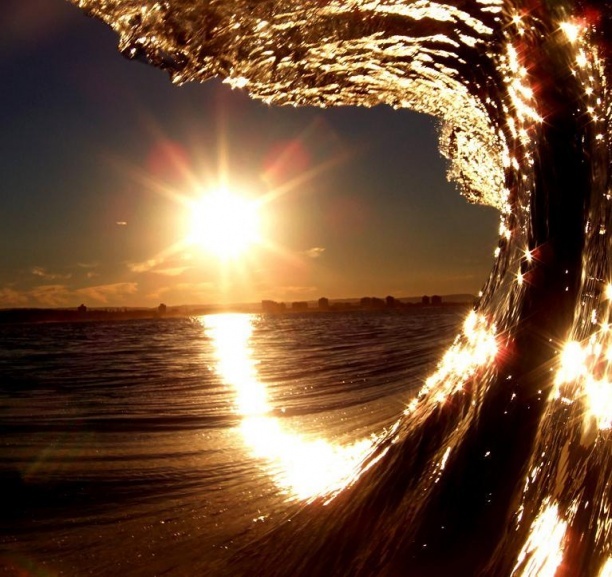 You forget about what wave you took that got you in that situation. It’s plainly and painfully Sisyphean. And then when you punch through, it’s all over. It’s a totally new start, the paddle is instantly gone, and you’re in the line-up, waiting for your wave, the paddle feels like the painful birth but the new experience is so shocking and different that the birth is instantly vanished from your landscape. When you ride a wave, and line up a good one that is fast and hollow, and it gives you a lot of face to gain speed and make maneuvers on, well then that’s it all over again. After sitting out in the water, largely in blissful silence, being slowly rocked by the passing swells, and then to find yourself racing down one of the faces, the tremendous shift from being almost dormant to full-on, heart-in-throat, I think adds quite a bit to why feeling “stoked” feels so intense and pervasive. The Buddhist mantra is about constantly being in the moment of existence, and I think the drastic differences between what you do when you surf–paddle intensely, sit and wait, and actually ride the wave–makes each moment become a lifetime of experience that twists and shapes everything. For the next day or several days your mind is warped by this blissful experience and it alters all your future experiences, and all of your thoughts get distorted into this amorphous state of exhaustion, satisfaction, and impatient anxiety about did I surf it the best, did I get out too early, could I have caught more waves, when is it going to be that good again. I surfed a bunch this weekend and will probably be in the water within an hour of finishing this, and so I am still warped by being stoked, and much more literally, stoked out of my mind. I’m hyper at the same time that I’m slowly and quietly observing. What the hell does all of this mean. I just want to get back in the water.